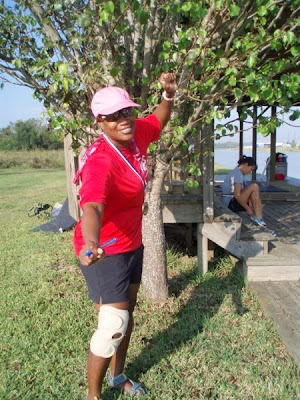 I am so honored to feature Frances Arzu as the Spotlight of the month for October. October is Breast Cancer Awareness month. Frances is a breast cancer survivor and she has a story to tell. Her story is your mother, sister, wife and friend story. Just as we bring awareness to breast cancer we also want to raise awareness to prostate cancer and all other forms of cancer. Most cancer can be cured if it is diagnosed early. There are medical treatments as well as natural alternatives aka herbs that can be taken. The sun barely peeks over the horizon as 20 Houston-area women dig into placid Clear Lake, cutting into the water with the synchronized attack of a platoon of well-trained soldiers. The women know a thing or two about combat; they are breast cancer survivors. My name is Frances Arzú. I am a breast cancer survivor currently living in Houston, Texas. I was born and raised in Belize City, Belize, but immigrated to Houston with my parents when I was in high school. Growing up in Belize, cancer was not discussed or at least, if it was, I don’t remember. Though, I knew that one of my maternal aunts had been diagnosed with breast cancer (not that I understood what that meant at that time). I just knew that she promised that she’d come back and tell us what it was like to be dead (she never did, at least not to my knowledge). It was still a complete surprise, when I was diagnosed in December 2003, with Stage IIB breast cancer. One would think that that would be the worse day of one’s life, but for me, it does not compare to the day my parents were both killed. With that being said, I tackled my breast cancer, as I do everything else, full speed ahead. This meant, researching as much as possible and involving my sister, Dr. Isidora Arzú, a radiation oncologist at MD Anderson Cancer Center (MDA), in my treatment, though, I was treated elsewhere, because my insurance would not cover treatment at MDA. At that time, I knew little about breast cancer, much less breast cancer in women of colour and pre-menopausal women. I later learned that although women of color are diagnosed less frequently than Caucasian women, they die at a much greater rate. What I have found to be true is that women of colour are diagnosed at a much later stage and are diagnosed with a much more aggressive form of the disease. It is recommended that a woman begin doing monthly self-breast examinations as early as the age of 18 and begin regular mammography screening at age 40. I had been doing my monthly self-breast examinations, but because I had naturally fibrocystic breasts, neither I nor my doctor felt the lump to be any different from the rest of the lumps. My doctor ordered a “baseline” mammogram before the age of 40 and that was when my breast cancer was discovered. My diagnosis was invasive Ductal Carcinoma, which was estrogen positive. I was treated with six (6) months of chemotherapy to shrink the tumors, lumpectomy (surgery) followed by 6 weeks of daily radiation. In my quest to be as educated as possible, I wanted to learn about lymphedema (swelling in the arms, chest and/or breast), after treatment. To that end, I was given a list of all the things that I was not supposed to do, unfortunately for them or me; I had already done 90 - 95% of those things. I was also told that I would never regain full range of motion on my surgery side, due to lymph node removal, so I started swimming only the backstroke, if only to prove the naysayers wrong. During one of my many check ups, Dr. Treneth Baker, my breast surgeon, listened to me whine about all the things I wasn’t supposed to do and said “Frances, don’t let them handicap you”. This was all I needed to hear, and there has been no turning back. I swim, scuba dive, run, travel and pretty much do whatever interests me. One of the blessings of breast cancer (yep, there actually are quite a few) was “my itty bitties”. Always large breasted, a lumpectomy did little to reduce my size. In 2007, I was referred to Dr. Yokel at Baylor College of Medicine, “a miracle worker”. At my initial consultation, I told him I wanted “itty bitties” – he looked totally confused (I’m sure it didn’t help, that he is from Turkey and didn’t have a strong command of “Texan”). Once he realized what I was asking for, he quickly told me there was only so much he could do. Well, he gave me my itty bitties, even if I have to keep explaining to everyone that they are itty bitties to me, if to no else and that I LOVE THEM!!!! Recent studies have clearly demonstrated that exercise, may provide positive benefits for the breast cancer survivor. As a result of my diagnosis, I have tried to eat healthier and exercise regularly. Besides doing a fitness boot camp, I am an avid dragon boat paddler. Initially, I had never heard of dragon boating, but was totally intrigued, when I was first introduced to the sport. Dragon boating presented the opportunity to get a full body workout without stressing any one part of the body. But, most importantly, you are on a team of all survivors. In 2005, I paddled in my first race and was hooked. I am inspired by the incredible Canadians Abreast team, an all survivor team. Our team won for the first time in 2006 and savored the moment. In 2007, a dedicated group of paddlers formed PINK PHURREE (pronounced FURY), the first year round, an all breast cancer survivor team in Texas. As a team, we’ve had many triumphs and a few losses. We have lost members to this insidious disease which gives us the impetuous to keep paddling and educating. Our team consists of survivors in all levels of treatment, ages, and attitudes; with the common goal of showing the world that we are active, vibrant, beautiful, talented and competitive women, just having PURE PHUN as we travel the world, racing. One of our goals is to help empower more survivors to fully rejoin life after breast cancer. Our next race is October 17 -18, 2009 in Sugar Land, Texas. On October 18, we are hosting a pink rubber duck race “KEEPING OUR DUCKS IN A ROW” to purchase our very own pink boat. For information on Pink Purée and to sponsor ducks, please go to: www.pinkphurree.org. This is a very interesting and educating story about breast cancer. I pray and hope that Frances keep on doing what she is doing now to keep ahead of this deadly enemy that is also a threat to men. Thanks Linda for featuring her as the "BELIZEAN SPOTLIGHT". I hope a lot of people read Frances story and follow the links to learn more about Breast Cancer. Hi Lin, I was very moved by the breast cancer survivor story. It is so encouraging how she took matters in her hands to participate in her recovery and healing. Thanks for sharing. I love the Michael Jackson songs as well. The fresh fruits and vegetables in Ethiopia looks so good.